Win Tickets to See Brett Eldredge at The Bomb Factory! The My New Country KSCS (the "Service"), operated by Triton Loyalty, and KSCS-FM (together, Triton Loyalty and KSCS-FM are referred to as "we", "us" or "our") is provided to you ("you," "your" or "User") under the following terms and conditions, including any amendments thereto and any additional terms and conditions, rules or policies that may be applicable to particular offerings made in connection with the Service (collectively, the "Terms and Conditions"). We reserve the right to update or change these Terms and Conditions from time to time. Any such changes shall be reflected in an updated version of the Terms and Conditions posted on this site. By continuing to use the Service following the posting of any such change, you will be deemed to have agreed to the amended version of the Terms and Conditions. Any failure to comply with these Terms and Conditions by you may result in the termination of your account, and the forfeiture and relinquishment of all Points you have accrued in the Service. BY REGISTERING TO USE THE SERVICE, YOU AGREE TO BE BOUND BY THESE TERMS AND CONDITIONS, SO PLEASE READ THEM CAREFULLY. Unless otherwise specified in connection with particular offerings, participation in the Service is open only to natural persons who are 18 years of age or older. Employees or agents of KSCS-FM, Triton Loyalty, and each of their respective affiliates, and immediate family members of or persons domiciled with any such persons are not eligible to participate. In consideration of your use of the Service, you agree to provide true, accurate, current and complete information about yourself as prompted by the registration form and to maintain and promptly update your personal data to keep it true, accurate, current and complete. If you provide any information that is untrue, inaccurate, not current or incomplete, or if we or any of our service providers have reasonable grounds to suspect that such information is untrue, inaccurate, not current or incomplete, we have the right to suspend or terminate your account and to refuse any and all current or future use of the Service (or any portion thereof) by you. You may not register with a disposable email address. Only one member account per person and two member accounts per household. If you are 18 years of age or under you cannot post information about yourself on the website or complete the registration process. You can, among other things, review your accumulated Points, review the Terms and Conditions as amended from time to time, and review redemption options at my.kscs.com . KSCS-FM and Triton Loyalty (collectively, 'us', 'we', 'Operators') have created this privacy statement in order to demonstrate our firm commitment to privacy. The following discloses our information gathering and dissemination practices for the My New Country KSCS website ('Site'). This sweepstakes will begin on 12/26/2018 12:51 AM CT and all entries must be received by 4/7/2019 11:59 PM CT. You currently have 0 entries. Prize: 2 Tickets to see Brett Eldredge at The Bomb Factory in Dallas, TX April 13, 2019. Terms and Conditions of Entry: NO PURCHASE IS NECESSARY TO ENTER OR TO WIN. VOID WHERE PROHIBITED BY LAW. A PURCHASE WILL NOT INCREASE YOUR ODDS OF WINNING. ALL FEDERAL, STATE AND LOCAL LAWS, RULES AND REGULATIONS APPLY. This sweepstakes ("Sweepstakes") is operated by My New Country KSCS ("Operator"). The Sweepstakes is subject to these Official Sweepstakes Rules, which shall be deemed to include the specific information outlined at the top of this page and that can be found on the sweepstakes information page (the "Sweepstakes Information Page"). The Sweepstakes Information Pages is available at http://my.kscs.com/Contest/DAXKVN. To enter the Sweepstakes you must complete the online entry form on the Sweepstake Information Page, and if [Points] are required for entry, you must submit the required number of [Points] for an entry, at which time the [Points] will be deducted from your account. The maximum number of entries allowed for this Sweepstakes (and the frequency with which you can enter, if multiple entries are permitted) is 1 per contest. An entry will not be valid unless all of the required fields of the online entry form are completed and the information is valid. Once submitted, an entry cannot be deleted, canceled or modified, except by the Operator. In the event of a dispute as to entries submitted by multiple individuals using the same computer, an entry will be deemed to have been submitted by the owner of the ISP account from which they were sent. For these purposes, an ISP account holder shall mean the natural person assigned to such ISP account by the Internet access provide, online service provider or other organization responsible for assigning email addresses for the domain associated with such account. Any questions regarding the number of entries submitted or the owner of an ISP account shall be determined by Sponsor in its sole discretion, and Sponsor reserves the right to disqualify any entries by persons determined to be tampering with or abusing any aspect of the Sweepstakes. You may also participate in a Sweepstakes through an offline entry. No [Points] are required for an offline entry. To enter offline, you must mail a 3" x 5" card to Triton Digital, 2125 Barrett Park Drive., Suite 112B, Kennesaw, GA 30144. You may enter offline as often as you wish, but limit one card per outer postmarked envelope. The card must include the following information in legible, hand-printed or typed English: your full legal name, complete home postal address, home telephone number with area code, the user name and email address you entered when you registered for the Service, your age, gender and the name and Item ID number of the Sweepstakes (DAXKVN). All offline entries must be received on or before the entry deadline, except that if a sweepstakes entry deadline is on a Saturday, Sunday or holiday, your offline entries must be received by the immediately preceding business day. If you are concerned about your mail-in entry being received by the entry deadline, then during the three business days immediately preceding the drawing date of a Sweepstakes you may fax in a photocopy of your offline entry card for that Sweepstakes. Limit one card per facsimile. The facsimile must contain a photocopy of the card with the full information listed above and must be received by the entry deadline. After faxing a copy of your entry card, you must still mail in your original entry card for your facsimile entry to be valid. Your original entry card must be postmarked prior to the entry deadline and must be received no later than 4 days after the drawing date. If your original entry card is not received by mail within 4 days after the drawing date, your facsimile entry will be void and you will forfeit any and all interest in the prize(s). Send all facsimiles to (770) 919 2120. Operator is not responsible for any incomplete, late, lost, misappropriated, illegible, damaged, postage-due or misdirected mail-in entries, or for failure to receive online entries due to transmission failures or technical failures of any kind, including, without limitation, malfunctioning or unavailability of any network, hardware or software, whether originating with sender or Operator. Eligibility: Sweepstakes are open natural persons and legal residents of the United States. You must be at least 18 years of age to enter unless a different age eligibility requirement is specified on the Sweepstakes Information Page. You must have a valid street address in the United States. (a P.O. Box address will not suffice). Certain Sweepstakes may be offered only to particular segments of the applicable Service. Employees or agents of KSCS-FM, other radio stations in [insert metro area], Triton Digital, and each of their respective affiliates, subsidiaries, and parent companies and the immediate family members of and persons domiciled with such persons are not eligible to participate. Prizes: Prizes for Sweepstakes include only those items expressly listed on the Sweepstakes Information Page for the corresponding Sweepstakes. Any other costs associated with the use or ownership of the prize is the sole responsibility of the winner. 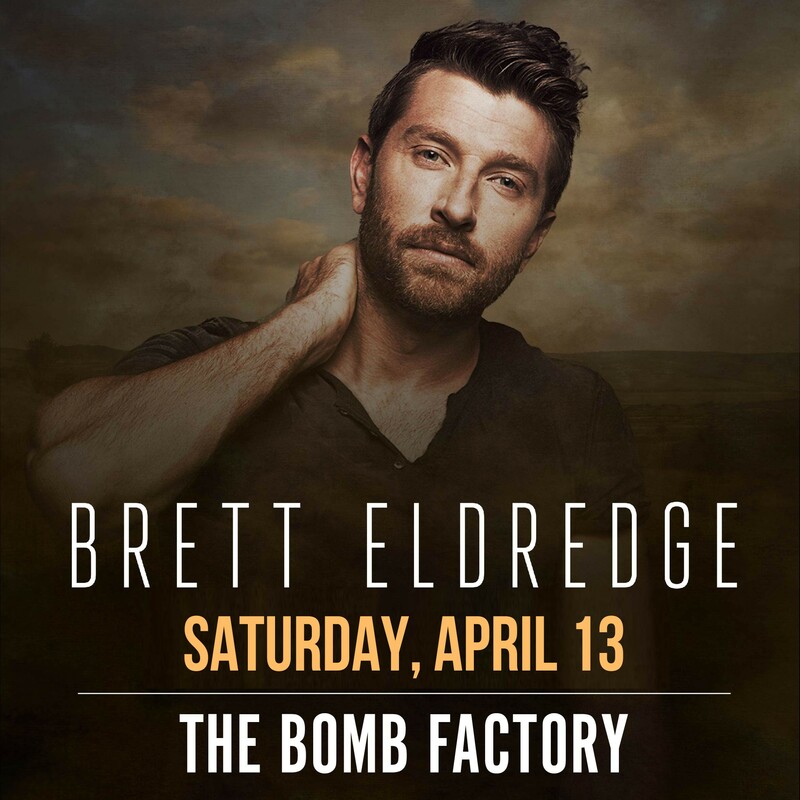 The Approximate Retail Value of each 2 Tickets to see Brett Eldredge at The Bomb Factory in Dallas, TX April 13, 2019. is 85.00. Winners, 5 to be selected, will be by a random drawing from among all eligible entries received during the Sweepstakes Period. Winners will be notified by email that the prize will be available to be Pick Up. In the event the winner cannot be reached within 14 days following attempted notification, or if the prize or prize notification is returned as unclaimed or undeliverable, the prize will be forfeited and an alternate winner may be selected. No substitution of any prizes except by Operator. No prize transfer permitted. No prizes will be refunded or exchanged for cash. If a prize is unavailable, Operator reserves the sole right to substitute a prize of equal or greater value. All taxes, fees, and surcharges on prizes are the sole responsibility of the winner. Operator will not ship any prizes to an address outside the United States. Winner's List: For a Winner's List, available thirty (30) days following the end of the Sweepstakes Period, send a self-addressed, stamped envelope to: Triton Digital Sweepstakes Winner's List, 2125 Barrett Park Drive., Suite 112B, Kennesaw, GA 30144. Please indicate which month's winner's list you would like to receive. Operators: This Sweepstakes is operated by My New Country KSCS. To contact the Operators, write to Triton Digital, 2125 Barrett Park Drive., Suite 112B, Kennesaw, GA 30144.